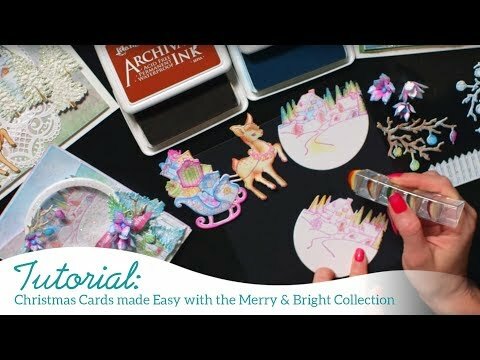 Merry and Bright collection, watch the tutorial at https://youtu.be/6bgO6epBuBI. To decorate the easel card: stamp crystal stemmed bowl, string of beads, and 1 set of ornaments with VersaMark then emboss with silver embossing powder. Stamp greenery-pine boughs and holly leaves with Fern Green and sponge with Leaf Green, cut pine cones and ornament sticks (cut ornaments off) with Rich Cocoa and lightly sponge with the same ink. Stamp Festive Holly with black and color with Copic Markers. Stamp Merry Christmas with Magenta Hue. 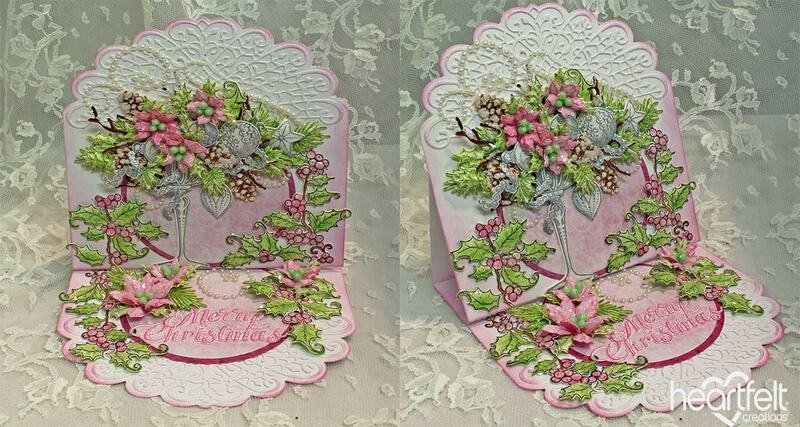 Stamp poinsettias with Magenta Hue and sponge color with Orchid Brilliance. Stamp holly clusters with Fern Green and sponge with Leaf Green. Die cut all pieces. Start inside by put down some pearl swirl embellishments, glue the Merry Christmas down toward the bottom and glue some of the Holly and berries (from Festive Holly and Cardinals) on each side of the circle die cuts. Glue some poinsettias down to make a stop for the card front (card will still lay mostly flat when closed). Add glitter to the flowers and leaves. The front: start by laying down some more pearl swirls then add stemmed crystal bowl with foam tape (leave very top tape free so that you can stick stems in). Glue and foam tape some Holly and Berries down to each side then start filling the crystal bowl with greenery, wood branches, ornaments, bead strands and pine cones. Add snow to all the greenery, branches and pine cones. Put together more flowers with stamen and glue down into bowl. Add glitter to flowers and greenery and also add silver Nuvo or Liquid Pearls to strands of beads. Allow to dry thoroughly before touching.